I have a CONDITION trigger and a FLIPEFFECT trigger on the same sector in NGLE. This is the script for the level. 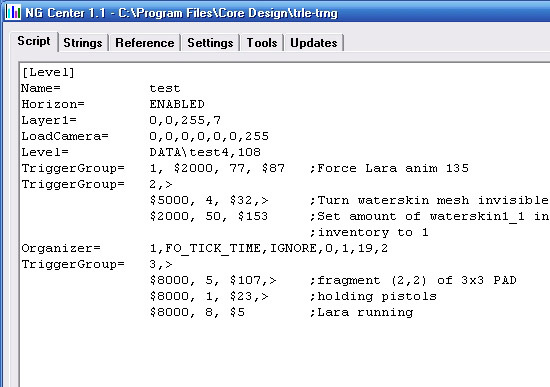 When Lara steps on the centre of the trigger sector she performs her pickup animation and the WATERSKIN1_1 object disappears at the correct point of her animation and is added to her inventory. Lara performs her pickup animation if she rolls onto the trigger and this looks strange. She also performs the pickup animation if she is holding her pistols and this looks cool but I don't want this either. So I need to add further restrictions (conditions) on when the FLIPEFFECT trigger can activate. I need more CONDITION triggers. Since the various CONDITION triggers have different timer and OCB button settings they are special triggers and I cannot overlap them. When you need to use multiple CONDITION triggers for a sector you need to export the CONDITION triggers as script triggers and create a TriggerGroup for them. Exporting triggers and creating TriggerGroups is explained in this tutorial. A TriggerGroup which only contains exported CONDITION triggers is a CONDITION TriggerGroup. 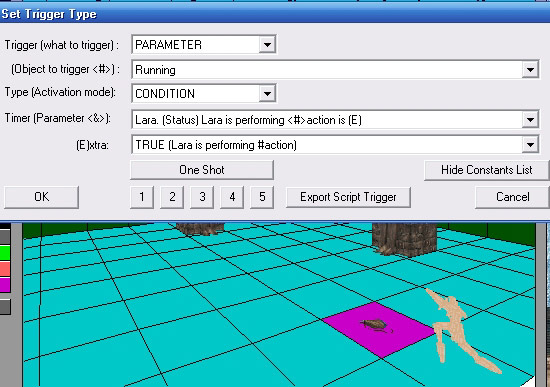 First select the CONDITION trigger on the sector in NGLE and export it as a script trigger because this CONDITION trigger in the level will need to be changed. This CONDITION trigger will only activate if Lara runs onto the sector. This CONDITION trigger will only activate if Lara is holding her pistols. This isn't exactly what we want but we'll work some magic later to fix it. Here is the CONDITION TriggerGroup in the script. 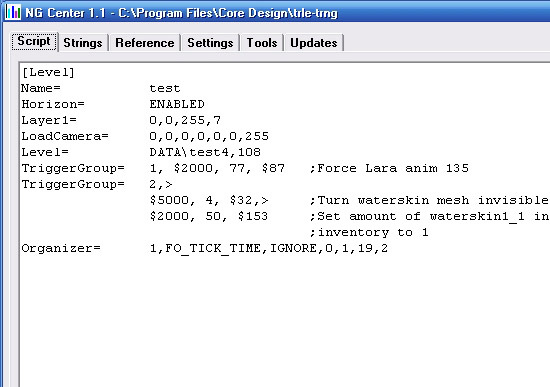 Notice that CONDITION script triggers start with the number $8000. This is the CONDITION trigger to use on the sector in NGLE. This means all the CONDITION triggers in the CONDITION TriggerGroup will be used to determine when the FLIPEFFECT trigger on the sector will activate. Notice that I have applied One Shot. When you export a script trigger the One Shot status is not included. If Lara is in the centre of the sector AND she is holding her pistols AND she is running then activate. If Lara is in the centre of the sector AND she is NOT holding her pistols AND she is running then activate. To do this I use a TGROUP_ flag mnemonic constant. These are explained in the TriggerGroup command in the new script command section of NGCenter's reference tab. To add a flag to another mnemonic constant you use a plus "+" sign. The flag I use is TGROUP_NOT. It must be added to the $8000 for the script trigger. Build the script and play your level. Make sure you have converted the level with the new CONDITION trigger on the sector. 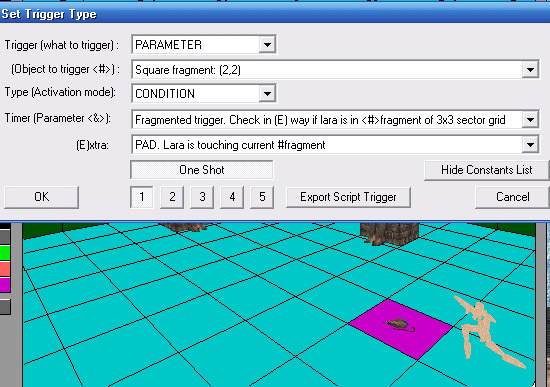 Note: To restrict Lara to performing the animation only when her hands are free I could have exported this CONDITION trigger and added it to the TriggerGroup instead of the not holding pistols condition. The MultEnvCondition script command to use is this.